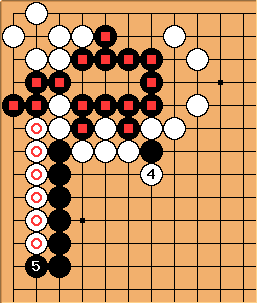 Here is the published solution for Hitachi Number 9. After Black 1, a and b are miai. 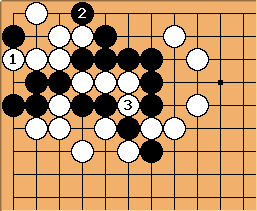 In this variation, White cannot play at c because of a shortage of liberties. 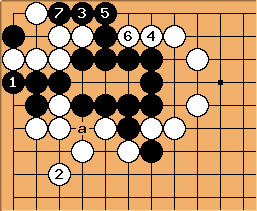 FCS: After Black 5, are Black's stones sufficiently saved? 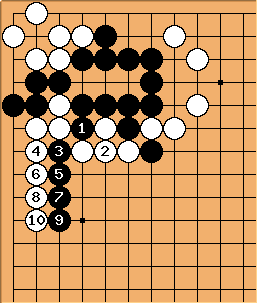 Once Black connects the square-marked group to the circle-marked stone White can not keep these stones from escaping into the middle of the board where they can (presumably) link to a strong black group or make two eyes. Thanks for the comment. I'll amend the original problem to include this assumption. This sequence is not so straightforward. See below (Dieter 2k). 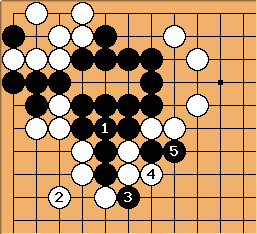 White's marked group only has six liberties while Black's marked group has at least seven. 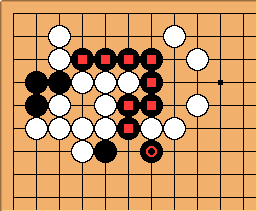 Can anyone improve on this? 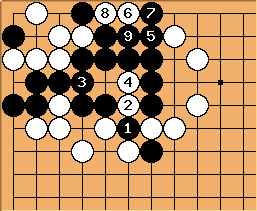 This sequence is confusing: Move number 9 prevents White from playing at a in sente, but lets White live with 10. 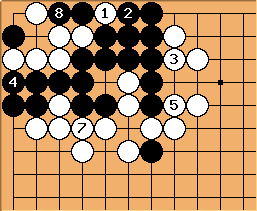 Black could kill White by playing at 10 himself. White 2 makes one eye and now threatens the connection at a or the second eye at b. However, she has a weakness at c, as shown. Black 1 prevents the connection. White now has to patch up the aji of Black a and plays kaketsugi at 2. 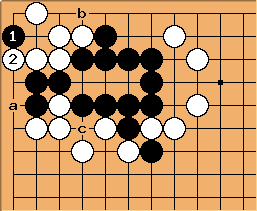 Black plays 3 to reduce White to one eye, and he wins the semeai. White still makes shape up to 8. 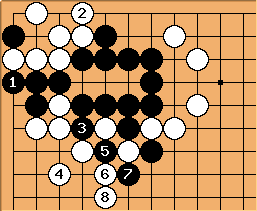 Of course, Black's better off, splitting the two white groups. White is five liberties down in this capturing race. 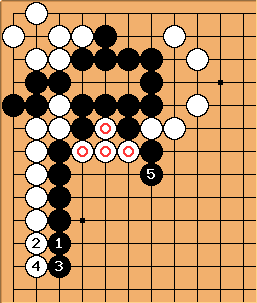 White 3 recaptures yet again - it's not a ko - and her stones are all connected. Although the marked white stones in the corner are dead, White still has the aji of the ogeima at b, so Black's corner is not too big. 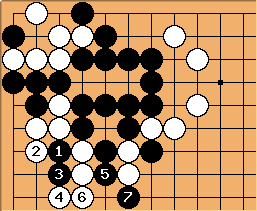 In the "capturing race" diagrams, White loses a lot of points compared to this diagram. 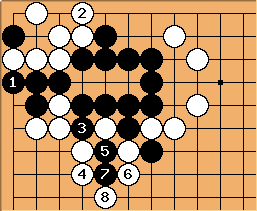 I don't understand, why can't Black play 1 in this diagram?